A busy week of cup finals this week begins this Tuesday with a trip to Suffolk to watch the Women’s League Cup Final with AFC Kesgrave Ladies playing East Bergholt United Ladies. A cup final appearance in their debut season for AFC Kesgrave Ladies a young squad making the step up to adult football this season. Hit the ground running winning there opening 2 matches. A run of losses then followed progress in the cup regaining some form has been up and down since with 6 wins from 15 played are comfortable in mid-table as the squad gains experience in the league. Both sides were handed a bye in the 1st Round to progress to the quarter finals of the League Cup. AFC Kesgrave were drawn at home up against Ipswich Athletic Ladies, a goal from Ashley Bustos along with a brace for Daisy Starsmoore in the 1st half seeing the club through to the last four of the competition. East Bergholt United starting the season with 4 successive wins took that form into the quarter finals of the League Cup where they were drawn away to another side with title ambitions Walsham Le Willow Ladies a close game a single goal settling the contest scored in the first half by East Bergholt’s Charlotte McGrath. Onto the semi-finals, AFC Kesgrave were away to Coplestonians Ladies, goals from Bustos and Starsmoore along with Jade Fox securing a 3-0 victory to secure a final spot for the club in their debut season in the Suffolk Women’s Division. East Bergholt United were at home in the semi-finals another tricky looking tie against Bacton United Ladies who have been on their heels in the league all season. A brace from Jessica Clarke with a goal each for Annie Northwood and Millie Wilding seeing East Bergholt United into their 2nd successive final. Brantham Leisure Centre the venue for this evening’s final home of Brantham Athletic FC a sports field adjoining the main pitch overlooked by a large clubhouse and bar. Hot food and drink available, needed fuel and they did a very nice cheeseburger. The pitch a good size a small covered seated stand behind the dugouts and another at the end of one end. Rained all day Monday and I did wonder if this evenings final would be on but today has been much better drying thing’s out overcast but mild. AFC Kesgrave Ladies starting XI – Jade Fox (C), Felicity Cooper, Jade Marsh, Lauren Godbold, Georgia Lane, Daisy Starsmoore, Georgia Clarke, Lina Nagid, Imogen O’Sullivan, Issy McCartney & Ashley Bustos. Subs – Christy Fraser. East Bergholt United Ladies starting XI – Kimberley Lynch, Harriet Meers, Emily Lambert, Deben Faiers, Millie Wilding, Georgina Longden (C), Charlotte Warren, Charlotte McGrath, Jess Quinsee, Georgia Lockerbie & Annie Northwood. Subs – Holly Prior, Pippa King, Jess Oxlade & Cara Savage. It’s East Bergholt to get the match underway kicking off 1st half wearing green shirts with black shorts and socks. Kesgrave lined up opposite wearing red and blue vertical striped shirts with blue shorts and socks. Moving the ball forwards Kesgrave look to press East Bergholt early on the ball played out to the left for Jess Quinsee to chase, Kesgrave defend see the ball out for a throw. Kesgrave attack up the left winning a throw the ball played on into the area Deben Faiers defending for East Bergholt as Georgia Clarke and Imogen O’Sullivan look to attack the ball top of the area. East Bergholt look to release their wide players, Quinsee left, Georgia Lockerbie on the right. Lauren Godbold stepping out of the back line for Kesgrave to tackle Quinsee as she cuts inside looking to drive towards the area. O’Sullivan attacks as she runs the ball down on the right a crunching tackle from Faiers the deflected ball running to Lina Nagid for Kesgrave 20 yards out left corner of the box shifts it inside one touch and shoots her rising effort wide of the top corner. A bright start from Kesgrave. East Bergholt quick to turn play around. Kesgrave with a free kick on half way the ball played forwards Nagid running clear in behind East Bergholt goalkeeper Kimberly Lynch coming to the edge of her area stays big does enough to as Nagid gets a shot away her strike placed wide of the post. GOAL! Kesgrave capitalise on their good start to the final getting forwards up the right win a throw in high up the pitch move it quickly players drawn across the cross comes in towards the top of the area O’Sullivan is there the ball into her path the keeper comes, the ball sent past her into the back of the net 1-0. Plenty of pace in the Kesgrave side. Lose possession on the left Quinsee breaking forwards is brought down a free-kick. Players up from the back for East Bergholt the delivery into the top of the area, Godbold defending for Kesgrave. The ball is won back on the left Quinsee with the shot driving the ball in from 25 yards out, Jade Fox in goal for Kesgrave right behind it claims the ball. Lockerbie wide right pushes forwards for East Bergholt she is tackled by Jade Marsh. GOAL! East Bergholt get themselves back on level terms attacking down the right the ball out for a throw deep inside the Kesgrave half the ball controlled and a low cross fired across the face of the goal, Quinsee there her 1st time shot initially blocked by the diving keeper is still active a scramble across the goalmouth, Quinsee gets it across the line to level the scores 1-1. GOAL! No sooner are East Bergholt back on level terms they take the lead and it’s Quinsee once again on the scoresheet. The attack beginning with Annie Northwood driving through the middle stopped by the Kesgrave defence the ball kept by East Bergholt put out to Quinsee left side she takes it forwards shooting from the angle as she arrives in the area the ball racing past the keeper at the near post 2-1. East Bergholt starting to get into their stride Charlotte McGrath in the middle of the park winning the ball looking to put Quinsee away on the left, Kesgrave intercepting the intended through ball. A double change for East Bergholt, Pippa King and Cara Savage coming on Quinsee and Northwood. King with an opportunity to shoot straight away her 20 yard effort taking a deflection out for a corner. A good delivery into the six yard box after a scramble for the ball Kesgrave get it to safety. Lockerbie with a header on looks to get into the area, Fox can come off her line to gather the ball. A change for Kesgrave, Christy Fraser on for Clarke. Nagid looks a threat for Kesgrave picking up the ball inside the East Bergholt half and taking it forwards Faiers coming towards her to put in the challenge win the ball back. Play turned around rapidly Lockerbie wanting it on the right. Felicity Cooper coming across to tackle her. A throw on the right the cross fired into the area a shot right side pulled wide of the post. Emily Lambert on for Charlotte Warren the pass forwards looking to release Savage in behind on the left Issy McCartney getting to it first for Kesgrave. GOAL! Half an hour played East Bergholt go further in front. Savage with the goal picking the ball up on the left a strong run forwards letting fly from distance the low shot racing across the keeper into the bottom corner of the net 3-1. Ashley Bustos getting forwards for Kesgrave evades Faiers tackle the pass on for Nagid, Millie Wilding winning the ball back for East Bergholt. Harriet Meers breaks up a Kesgrave attack at right back her ball into the middle for Longden play spread out to Savage tackled the ball out for a throw wide left a change for Kesgrave O’Sullivan off Clarke back on. Lockerbie links up with King as East Bergholt attack playing a one two the cross into the area claimed by the keeper. East Bergholt are strong through the middle Warren on for McGrath her pass forwards for King op of the area the ball defended runs to the right King seeing another attempt charged down. Nagid with a twisting run through the middle McCartney breaking ahead of her on the left the pass intercepted by Meers. Faiers in again to tackle Nagid as she comes forwards through the middle. Nagid keeps probing through the middle a good run takes on the shot her effort stopped by Wilding almost puts Bustos in on goal inside the area on the follow up pounces on the loose ball Lynch diving at her feet reacts quickly to lay claim to the ball six yards out. McGrath with good combination play linking with Lockerbie right side progress down the right Cooper coming to support Marsh Kesgrave concede the throw in. Northwood returning to the field for Longden. East Bergholt dominating late into the 1st half bodies up and around the Kesgrave area, no final shot. Kesgrave break forwards Bustos fouled in front of the centre circle. Players come forwards as the ball is played up into the box Wilding with the header the ball falling into the area Cooper central with the snap shot the strike wide of goal. A 3-1 lead for East Bergholt as the referee brings the 1st half to a close. Kesgrave lively from the start taking an early lead East Bergholt finding a quick reply turning the game completely around to lead moments later. Have looked a threat using the wide players well stretching play. Kesgrave far from out of it have the pace to counter attack and create chances. East Bergholt extending the lead. A two goal advantage Kesgrave can put pressure on if they score early 2nd half. Kesgrave to get the 2nd half underway. Pushing on win a corner early on in the 2nd period. A great delivery towards the far post dropped inviting the header duly obliged the ball put up and over the crossbar. Northwood played in on the left side attacks for East Bergholt the sliding tackle coming in the ball won back. Northwood getting hold of the ball for a Kesgrave goalkick plays it back across the top of the area Lockerbie sending a ball into the area McGrath with the run can’t quite get on the end of it. GOAL! The early goal comes 2nd half unfortunately for Kesgrave it goes against them East Bergholt taking advantage from a slip on halfway as Kesgrave are awarded a free-kick the ball pounced on by Northwood a fantastic diagonal ball to the right releasing Lockerbie in behind lets fly form 25 yards out her strike past the keeper to make it 4-1. A few times in the match East Bergholt have gotten the ball out wide getting into a good crossing position the ball coming into the area no one has gambled through the middle Kesgrave able to clear the ball without challenge. Nagid has taken a knock for Kesgrave comes off. King puts an effort on goal wide as she attempts to lob the keeper after she goalkick comes straight to her 25 yards out. A triple switch for East Bergholt, Meers, McGrath and Lockerbie off on come Holly Prior, Jess Oxlade and Quinsee returning to the field. East Bergholt looking the more dominant side push players forwards. A long ball forwards from the middle sees Clarke head the ball out wide to O’Sullivan she attacks trying to get into the area, Faiers with the tackle putting the ball out for a throw. Nagid returns to the field for Kesgrave, Clarke giving way. Northwood getting away clear on the left her ball inside the box to Oxlade she lays it back for Savage, Cooper closing her down. GOAL! Sustained possession on the right from East Bergholt wins them a corner kick the six yard box crowded as the ball in swung in high dropping across the face of goal Savage with the bullet header to bury the ball into the back of the net claims her 2nd of the final 5-1 the lead with a little over 20 minutes to play. GOAL! East Bergholt continue to press forwards savage winning the ball the pass on for Northwood on the left comes inside stopped on the edge of the area. Wilding with the tackle up the other end 20 yards out as Nagid is played on through the middle for Kesgrave. A double save with her leg for the Kesgrave keeper stopping a driven shot fired in from the right side, deflected back out into area Oxlade closed down by McCartney gets a shot away again the keeper saves with her leg the ball cleared out of the area Kesgrave loosing their shape as East Bergholt press on the ball won back is with Savage is a long way out the keeper out of position fires it back in an unorthodox strike but effective as it loops up and drops into the back of the net, a Cup Final hat-trick for Savage 6-1. Savage is brought off soon after along with King, Longden and McGrath returning. Faiers gets forwards with the ball from the back for East Bergholt has a shot her effort over from 25 yards. Northwood comes close to getting a goal for East Bergholt as she is played in behind through the middle her rising strike inside the box right of goal kissing the woodwork on it’s way out. Alice Longden comes on for East Bergholt replacing Wilding. Late into the game Kesgrave tiring haven’t the subs to bring on like their opponents aren’t able to keep the ball as East Bergholt continue to press bodies on. Into the final 10 minutes. McCartney given time and room in the middle gets a shot away for Kesgrave, Lynch behind it all the way in the East Bergholt goal. Northwood put in the clear on the left shoots from the angle the ball whipping wide across the goal face. Nagid with Bustos on the left get forwards the shot driven in wide of the near post. GOAL! Quinsee is brought down on the right as she threatens to run in behind clear to attack the goal. A free-kick in a dangerous position 20 yards out right corner of the box, Georgina Longden to take a great strike it flies in a foot under the cross bar to bring up East Bergholt’s 7th goal 7-1. Into stoppage time East Bergholt on top Quinsee attacking on the right brought down once again. Kesgrave able to defend the set piece this time. The final whistle blows and East Bergholt claim their 1st trophy winning the Suffolk Women’s League Cup. A much better feeling for East Bergholt this time around after last season’s penalty heart ache. 7-1 the winning score a dominant performance once they got into their stride rotating their players frequently. Finding space out wide and recovering from an early set-back. Kesgrave buoyed by their start certainly have talent within their squad, pace good movement will improve 3-1 down at half -time conceding the 4th goal early in the 2nd half was a cruel blow and East Bergholt took full advantage. Never the less Kesgrave should be proud to have reached a Cup Final in their debut season in the Suffolk Women’s Division. The League Cup won the double still very much on. Rivals Walsham Le Willows and Bacton United Ladies also playing tonight a 2-1 win for Bacton puts them 3 points behind East Bergholt with one each left to play. Walsham Le Willows are now 8 point behind with 3 to play, East Begholt’s final league game is away to Walsham Le Willows on Sunday 13th May. A good all round performance from East Bergholt this evening the defence standing form when called upon, midfield competing for the ball and the wide players a threat whoever took up the position. Overall for her Cup Final hat-trick tonight’s Women’s Football East – Player of the Match award goes to Cara Savage. Congratulations to East Bergholt United Ladies on winning the Suffolk Women’s League Cup. Thanks to both clubs for their help with the team details tonight always appreciated. Onto Cambridgeshire for their Women’s League Cup Final. 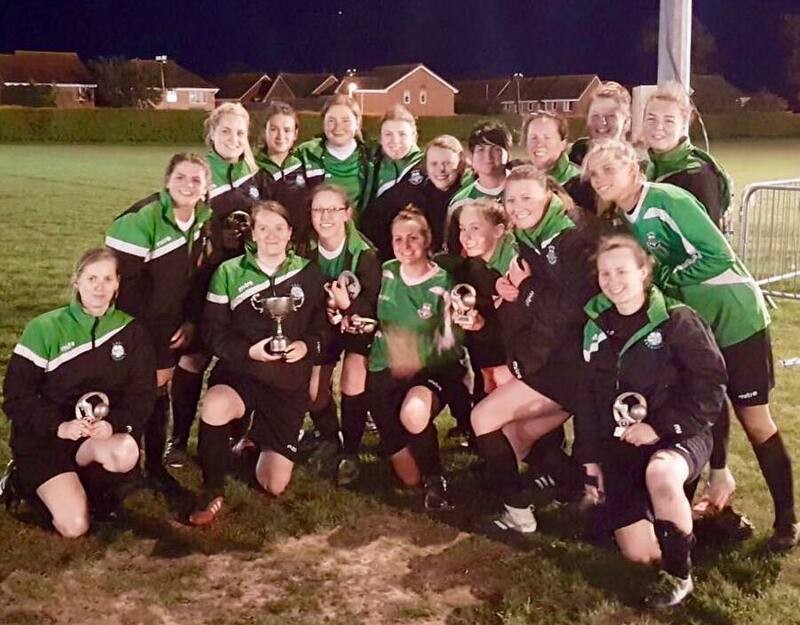 This entry was posted in Cup Final, Match Reports, Suffolk Women's League Cup and tagged AFC Kesgrave Ladies, Cup Final, East Bergholt United Ladies, Match Report, Suffolk Women's League Cup on May 2, 2018 by WFEast.